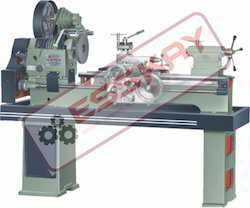 We offer a superior range of Lathe Machines that can be availed by our clients as per their specific requirements. These machines are specially designed using superlative grade raw material that is in adherence to the industry quality standards and norms. A metal lathe or metalworking lathe is a large class of lathes designed for precisely machining relatively hard materials.They were originally designed to machine metals; however, with the advent of plastics and other materials, and with their inherent versatility, they are used in a wide range of applications, and a broad range of materials.These machine tools remove material from a rotating workpiece movements of various cutting tools, such as tool bits and drill bits.The main spindle is generally hollow to allow long bars to extend through to the work area.The bed is a robust base that connects to the headstock and permits the carriage and tailstock to be moved parallel with the axis of the spindle. This is facilitated by hardened and ground bedways which restrain the carriage and tailstock in a set track. The carriage travels by means of a rack and pinion system. The leadscrew of accurate pitch, drives the carriage holding the cutting tool via a gearbox driven from the headstock. We supply a wide range of Lathe Machines SERIES (V BELT DRIVE) "KL", which is fabricated using outstanding grade metal alloys and other raw material that are in compliance with the industry standards. Furthermore, we stringently test this sourced raw material on several quality parameters as laid down by the industry regulatory bodies. TheLathe Machine bed is a robust base that connects to the headstock and permits the carriage and tailstock to be moved parallel with the axis of the spindle. This is facilitated byflame hardened and ground bedways which restrain the carriage and tailstock in a set track. The carriage travels by means of a rack and pinion system. The leadscrew of accurate pitch, drives the carriage holding the cutting tool via a gearbox driven from the headstock. Types of beds include inverted "V" beds, flat beds, and combination "V" and flat beds. "V" and combination beds are used for precision and light duty work, while flat beds are used for heavy duty work. A Horizontal lathe is a large class of lathes designed for precisely machining relatively hard materials. They were originally designed to machine metals; however, with the advent of plastics and other materials, and with their inherent versatility, they are used in a wide range of applications, and a broad range of materials. These rigid machine tools remove material from a rotating workpiece via the movements of various cutting tools, such as tool bits , drill bits and boring tools. We are expert in manufacturing high quality Lathe Machine V-Belt drive Series "KM". Our machines are designed using superior grade raw material, which we stringently test on different quality parameters. Furthermore, we offer customized solutions with our product range to meet the desired specifications of the clients. We supply a wide range of Lathe Machines SERIES (V BELT DRIVE) "KM", which is fabricated using outstanding grade metal alloys and other raw material that are in compliance with the industry standards. Furthermore, we stringently test this sourced raw material on several quality parameters as laid down by the industry regulatory bodies. A toolroom lathe is a lathe optimized for toolroom work. It is essentially just a top-of-the-line center lathe, with all of the best optional features that may be omitted from less expensive models, such as a collet closer, taper attachment, and others. The bed of a toolroom lathe is generally wider than that of a standard centre lathe. There has also been an implication over the years of selective assembly and extra fitting, with every care taken in the building of a toolroom model to make it the smoothest-running, most-accurate version of the machine that can be built. However, within one brand, the quality difference between a regular model and its corresponding toolroom model depends on the builder and in some cases has been partly marketing psychology. For name-brand machine tool builders who made only high-quality tools, there wasn't necessarily any lack of quality in the base-model product for the "luxury model" to improve upon. In other cases, especially when comparing different brands, the quality differential between (1) an entry-level center lathe built to compete on price, and (2) a toolroom lathe meant to compete only on quality and not on price, can be objectively demonstrated by measuring TIR, vibration, etc. In any case, because of their fully ticked-off option list and (real or implied) higher quality, toolroom lathes are more expensive than entry-level center lathes. The compound rest (or top slide) (2) is usually where the tool post is mounted. It provides a smaller amount of movement (less than the cross-slide) along its axis via another feedscrew. The compound rest axis can be adjusted independently of the carriage or cross-slide. It is used for turning tapers, to control depth of cut when screwcutting or precision facing, or to obtain finer feeds (under manual control) than the feed shaft permits. Usually, the compound rest has a protractor marked in its base (2b), enabling the operator to adjust its axis to precise angles. The terms center lathe, engine lathe, and bench lathe all refer to a basic type of lathe that may be considered the archetypical class of metalworking lathe most often used by the general machinist or machining hobbyist. The name bench lathe implies a version of this class small enough to be mounted on a workbench (but still full-featured, and larger than mini-lathes or micro-lathes). The construction of a center lathe is detailed above, but depending on the year of manufacture, size, price range or desired features, even these lathes can vary widely between models. Some lathes have only one leadscrew that serves all carriage-moving purposes. For screw cutting, a half nut is engaged to be driven by the leadscrew's thread; and for general power feed, a key engages with a keyway cut into the leadscrew to drive a pinion along a rack that is mounted along the lathe bed. When a lathe is installed, the first step is to level it, which refers to making sure the bed is not twisted or bowed. There is no need to make the machine exactly horizontal, but it must be entirely untwisted to achieve accurate cutting geometry. A precision level is a useful tool for identifying and removing any twist. It is advisable also to use such a level along the bed to detect bending, in the case of a lathe with more than four mounting points. In both instances the level is used as a comparator rather than an absolute reference. 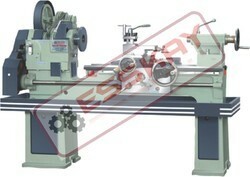 Looking for Cone Pully Lathe Machine Series KL-165-KH-250-80 ?